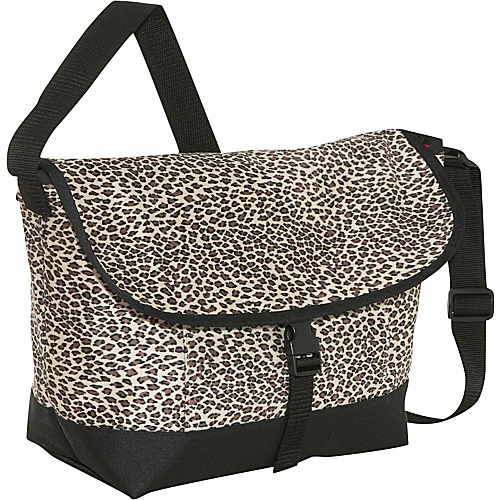 Bring your infant or toddler’s things with you with comfortable, casual, designer style in the Sally Spicer Baby Messenger Bag in Cheetah print. This soft, smooth, plush, and luxurious-looking yet affordable faux suede diaper bag features flapover construction and two-tone styling with a solid base and vibrant print pattern, and it’s available in several colors and designs. It has a quick-release buckle closure, and it boasts a roomy, brightly-lined, easy-to-clean, waterproof, interior with a changing pad in its own compartment; roomy open pockets perfect for holding diapers and wipes; a cell phone pocket; a bottle pocket; a pacifier pocket; and plenty of space for your little one’s clothing, blanket, and favorite stuffed animal. Its open front pocket offers quick access to your keys and other frequently-needed items, and it comes with an adjustable webbing strap. Comes with removable changing pad.